The planning for the party started just few weeks before her party being the lazy us. I wanted the party to be very special and something that everyone including Saanvi to cherish forever. We had a tough time figuring what theme we could have and finally decided to go with the Safari/Jungle theme for her party. We thought Safari party was the most simplest to have as we could quickly buy some animal cut outs and make it look like a jungle. We were soo wrong , we had to create every bit of the party by ourselves. But, it all paid out , I should say ..
Saanvi's month-by-month chart: I made four canvases with jungle sketches and stuck Saanvi's pcitures for each of the 12 months. I loved the way it came out and going to have it in our room :). I sat down over one weekend , had some pictures of these really cute animals . I drew them on chart paper and cut them out . The lion was the 1st one. I cut his body structure out and cut petals out of crepe paper and stuck it around his face to give the wild look. Elephant was the 2nd guy , I love elephant's ears, they look so cool, especially when they keep flapping them . I cut out the elephant's ear with another sheet of paper and stuck it on them. It worked out . Zebra was the 3rd guy. He was tough. I drew him, cut him out on the chart and had to literally cut thin strips of paper to give him his skin. My friend cut his tail out and gave the additional look to it :). Giraffe was the last guy. He was easy , just had to draw, cut him out and stick brown dots all over his body. We wanted a backdrop for the cake table. I visited all the party shops in the city and dint find anything impressive. I decided to create my own backdrop. I made a wide banner with brown paper, printed the same pictures of Saanvi's that were on her card, blew them up and stuck it to the banner. I cut some grass and trees of the crepe paper and stuck them . I also pasted the dollar shop foam animal stickers.We dint have Saanvi's name cut out until the last minute. One of our friends wrote it the curly style and cut them out for me. I had a garland of all the animals with the "Happy Birthday" on it. Cake: I kept looking online for safari cakes and finally found this girl near my house who bakes amazing cakes. I told her the color theme of the party and the animals , I wanted on the cake. She baked the most amazing cake. We had two layers. The 1st yellow layer was a marble cake with raspberry filling and the 2nd brown layers was a ultimate chocolate cake. It had these tiny animals which matched to the animals , I had on my card and everything about the cake was edible. Everyone loved the cake. Cup Cakes: We had 24 cupcakes in brown and yellow and I these tiny animals as their toppings , which looked super cute. Party Favor: I searched online for like a month to find a good return favor. I did not find anything that went with the theme. I finally bought some wooden photo frames , as everyone can use them with their favorite pictures. I stuck few animals on them and designed a 'Thank You' note that was slided it into the photo frame. It was simple and sweet , atleast I thought so :). Dont you simply love her ideas?? Read Naveena's Log Book for more ideas and details on this party... It is truly amazing... how she put this together!! These are images from Laura who blogs at Pushing Furniture... Laura is a true decor addict.. her DIYs are amazing.. and always so so well planned... She is an artist, a musician, and a lot more.. Do visit her... and see what she's upto!! For now... I'm showing you.. her entry to the Green Thumb Decor.. The above image is Variegated Ficus tree and a Dracaena warneckii, plus some little bits & clippings in jars.... all over her fireplace !! Laura's Buddha in the herb garden right off her back porch! Another Ficus, and a large Bird of Paradise (left) over my meditation corner at one end of the living room! and one more... in her bedroom... Aren't these images simply gorgeous... ?? Making Masti... shows off glimpses of her grand parents house and garden... This is simply stunning!! Lush green garden with bursts of creativity, style and colour are from Sunny Yellow Window's parents home... Its wow!! More from Shivani... didn't I tell you she is a bundle of talent!! Here is her creative door way... with bursts of green! And the winner... is this gorgeous herb garden... by Not Yet 100 Hub.. What can I say?? I'm just in awe!! Please can we have a tutorial on how you maintain such a gorgeous space?? Now for perfect creativity and an artistic approach... go on and check Hues at 5... These are recycled bottles with a money plant... Stunning.. Isn't it?? Where did my long weekend disappear?? The week ahead is going to be absolutely manic!! I was off on Thursday... as it was Yva's birthday... She was pleased to see me at home... After a lazy morning, we went for a swim... then wandered off to Cafe Ceramique ... Both girls painted plates... I helped Yva paint hers... Then they got her a little cake... and sang 'happy birthday'... Aaaawww.. my little pumpkin!! Friday was a gorgeous day as well... I lazed around... And for all those who got excited about the pool on my terrace... this is how it looks... We had an awesome time... *smiles* The gazebo got fixed on Friday... and the Saturday winds have destroyed it again... Thankfully ... its not torn... so I just have to clip it up again... *sigh*... project for the months ahead!! Saturday... we had the lights off for Earth Hour... It was lovely to sit and talk to the girls about how we can contribute... in our little ways.. and then to see the ideas they have!! .... so Saturday evening look as gorgeous as this... with candle lights... and lots of laughter!! this table top is linked to Marty's tabletop party!! Hope you are linking up this weekend... Do a post on your blog about your weekend and more.. and link in here... Can't wait to see you!! 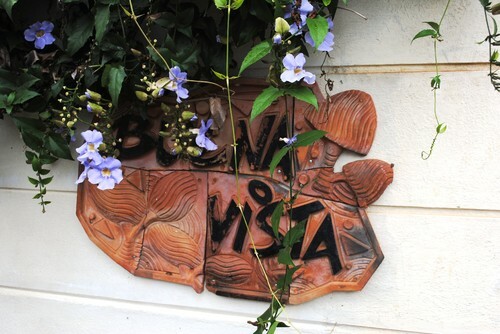 I have to redo this post... Rama's gorgeous terracota board with the name of the house.... that reads 'Buena Vista' meaning beautiful view in Spanish... Her home is designed using Spanish architecture... more on that later... but for now..... her Green Thumb Decor !! Love is the only flower that grows and blossoms without the aid of seasons, said Kahlil Gibran. I say that these beautiful blue flowers too grow without the aid of seasons, they are there all year round: a feast to our eyes! Blue flowers hold a special significance in the language of flowers and apparently – given their long-standing popularity – a special place in our hearts as well. Blue flowers represent tranquility and harmony, and give a sense of stability, confidence, honesty and security. Blue flowers, traditionally rare in nature, represent confidence and security. Go on and join the Green Thumb Decor link party... and inspire us all!! Girls are special... aren't they? The day bed below was changed to white.. We picked this one up from the 'As Is' section in IKEA... for next to nothing... But the black colour didn't look too good... so we changed this to white.. Thank you Ashwin... for joining my committee of elves..
Ramya, Rose, Ashwin, Simone & Yvonne (my girlies) painted a this beautiful butterfly garden on it... Now it looks like a 'happy cabinet'.. Linking into a few blog parties..
Do you like my girls butterfly - ballerina room?? I cant stop talking about walls…. Can I?? You’ve seen my peacock wall… which is my all time favourite… This one… ‘My Wall of Frames’… *smiles* is another special one… Close to my heart!! ... coz I’m not someone who can easily put two frames on one wall… I’d rather paint, than drill and hang!!! Do you have the same feeling?? This one took a while to prepare…. a long time to comfort my heart… that a few holes in the wall only mean a beautiful wall… *smiles* Then came the decision of which wall to do this with?? The wall that we choose had a/c & light controls… How do we incorporate that into a frame wall?? A true labour of love… from start to finish!! All the photographs are clicked by ‘moi’ during our holiday to Jaipur last year and of course some of my favourite photographs… The first step was deciding what I really wanted to do with the wall…. Then the hunt for frames began!! Once I had all the frames… I printed the photographs… Then laid them out of the floor… the way they’d be finally on the wall… That started a series of arranging, re-arranging, viewing… viewing from different angles.. and finally… this is what came out of it…. Oh… The lovely traditional door …. That you see is an exquisite piece of work… artistic and intricate!! I needed something to hide the light switches and the a/c controls on this wall… So off I went hunting for a perfect door… When I saw this…. In my favourite antique shop in Karama… my jaw nearly dropped!! I simply had to buy it…. The wall came together bit by bit…. The individually hand picked frames, the colourful frames, the tambourine, the door, the photographs… Each item to suit the tones & hues.. not only of the pictures but of the room they are housed in as well… Do you know what’s behind the piece de resistance – that tambourine? Do you?? Take a wild guess?? The A/C controls… Don’t you think that’s a fantastic idea?? Take a closer look and you’ll see them… the door hanging conceals the light switches and the tambourine conceals the a/c controls… What do you think? Ideas… suggestions… comments… scope for improvement?? Bring it on! !